Apple has started airing a new commercial for the iPhone 5S, titled “Powerful.” The commercial starts off with musicians using various apps on their iPhones to prepare to play, and then segues into from a music theme to a broader usage of iPhone apps for a variety of tasks, ranging from filming video to translating foreign languages, monitoring hear rate, and looking at a star map. The ‘Powerful’ commercial has the song “Gigantic” by the Pixies playing in the background, providing for a very different feeling than Apple’s other recent TV advertisement efforts for their products, which tended to be more sentimental. 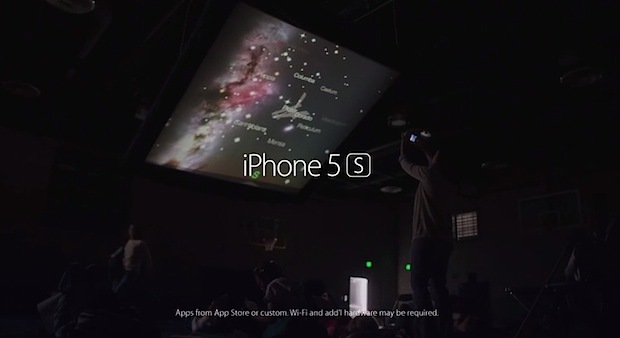 Apple has created a web page to accompany the commercial as well, highlighting some of the apps shown in the advertisement. Apple Moving Macs from Intel to ARM Processors? Pro tip. Hit the “mute” button to make the commercial better! Ha, yes! My thoughts exactly. Mediocre commercial made even worse with a ear-splitting choice of bad music. What an absolutely dreadful ad. I predict a shorter run for this one than those horrible Mac ads they somehow approved last year, remember those? Apple has leaped off the horse with this one, time to get back on with those Poetic ads that Robin Williams was doing voiceover for. Please do a grammar/spelling check before posting articles. “…segues into from…”??? Makes this article about as non-sensical as the Apple ad that is described. Have an editor (or two) check/double-check, please! No need for an editor on this article, we have you RCJ! Silly people – this is an awesome tune, I was happy to it used in this advert.